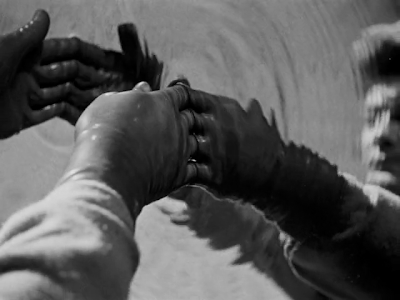 Jean Cocteau – the flaming French King of high camp, and full-time poet and sometimes filmmaker – once wrote, “Buñuel’s masterpiece Un Chien Andalou proves that cinema is a wonderful and dangerous weapon in a poet’s hands,” which is certainly a quote that applies to all artists, but especially his celluloid masterpiece Orpheus (1950) aka Orphée; a suave surrealist retelling of the classic Greek myth of Orpheus set in post-WWII France (and partially in the actual ruins of the war) and the second entry in the masterfully mystifying auteur’s black-and-white yet considerably colorful Orphic Trilogy (following The Blood of a Poet (1930) and preceding Testament of Orpheus (1960)). Utilizing the strikingly surrealist special effects and elegant camera tricks he pioneered with his first film The Blood of a Poet (1930) aka Le Sang d'un Poète and further fine-tuned for his highly reflective cinematic swansong Testament of Orpheus (1960) aka Le Testament d'Orphée, Orpheus manages to bring relative narrative coherence, albeit of the charmingly campy (but never schlocky) and casually carnal sort, to carefully constructed transcendental images that make for the most delightful of daydreams. 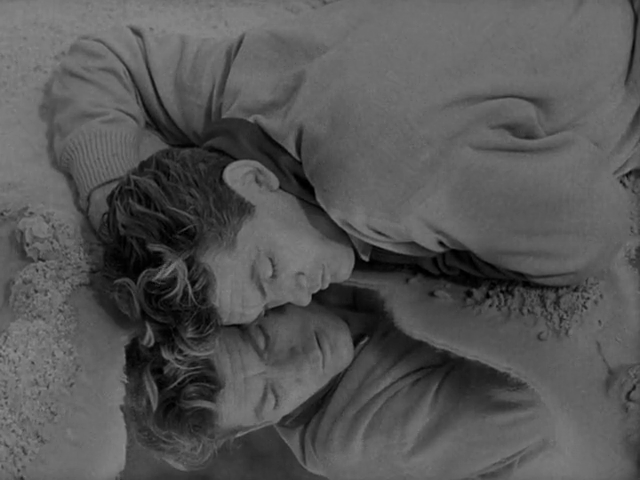 Speaking of Orpheus in particular, Cocteau wrote, “Beauty hates ideas. It is sufficient to itself. A work is beautiful as a person is beautiful. The beauty I mean (the beauty of Piero della Francesca, Uccello and Vermeer), causes an erection of the soul. An erection is unarguable. Few people are capable of having one: most, as in the famous drawing by Forain, consider that ‘it is much better to talk.’” And, indeed those suited for metaphysical arousal via aesthetics know that Cocteau’s inventively idiosyncratic images, especially in regard Orpheus, also know that the auteur poet’s visuals speak louder than the character’s words. One of the French artists least affected by the tragic chaos of the Second World War, Cocteau – a personal friend of Nazi sculptor Arno Breker and Conservative Revolutionary ‘proto-nazi’ novelist Ernst Jünger (who often socialized with the poet when he was stationed in Paris as an administrative position as a German army captain), as well as the likes of Pablo Picasso and Coco Chanel – still managed to implement reminders of the Occidental apocalypse via authentic ruined buildings (representing an apocalyptic sort of industrial hell) destroyed in the war, genuine radio recordings from the French resistance, and leather-clad servants of death on motorcycle who echo back memories of the Gestapo in Orpheus; a film where a middle-aged poet must reinvent himself by accepting sweet death in voluptuous hourglass, femme fatale form of fetishistic forlornness and fecund fury. A world of abject aesthetic decay where books with blank pages without words are considered the height of cultural vogue, Orpheus features a provocative story that is, unfortunately, even more relevant today about a once-important poet who must literally go to hell and back to save his life, wife, and artistry from the charms of death. 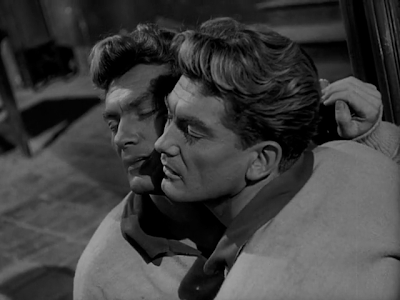 Starring Cocteau’s real-life beefy blond beau boy Jean Marais in the title character “Orpheus” in a perfect performance which he responded to critics’ praise of by stating, “The film plays my parts for me,” Orpheus is as aesthetically rapturous and solacing as cinematic works come despite the film’s sometimes gloom and doom yet always gorgeous subject manner. 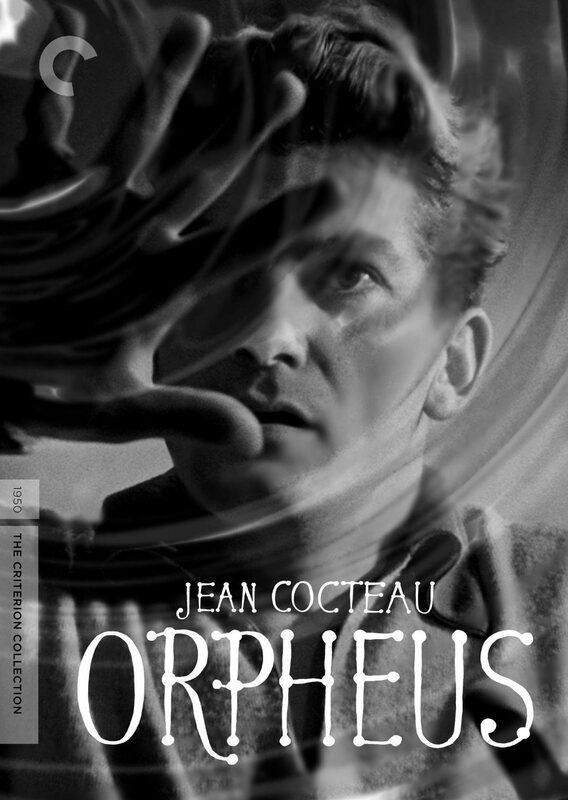 According to Cocteau himself, "Orpheus has three major themes: 1. The successive death through which a poet must pass before he becomes…changed into himself at last by eternity. 2. The theme of immortality. 3. Mirrors: we watch ourselves grow old in mirrors. They bring us closer to death." Of course, Orpheus also features a handsomely assembled hodgepodge of Orphic and modern themes that are so seamlessly synchronized that one need not be familiar with the film’s ancient source material to embrace it for eternity. In the beginning of the film, we meet protagonist Orpheus – an aging poet who feels he is past his prime and whose all-consuming pessimism is only all the more inflamed by his friend’s frank statement that he stopped writing at age 20 when he no longer had anything to say – who feels quite out of place in the company of youthful wordsmiths while lounging at the Café des Poètes, especially the young and popular dilettante lyricist Jacques Cégeste (Edouard Dermithe); a pretentious prick of (non)poetry whose wordless work “Nudisme” ('nudism') of naked pages is all the rage in post-WWII Paris. Orpheus is now so positively passe that even police men respect him, which certainly puts him out of sway with the youth, who are more subversive than ever before, as iconoclastically destroying the aesthetic and political systems of yesteryear is now the trend of the day and apparently no one does it better than charismatic conman Cégeste. 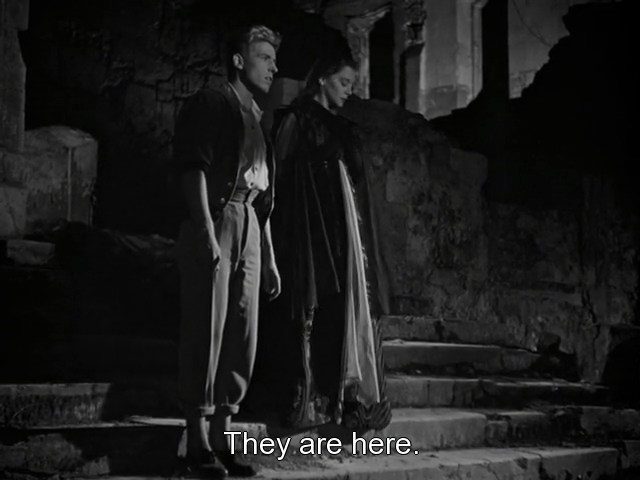 To his dismay, Orpheus' young rival, who is more than a bit inebriated, arrives at the café in grandiose style in a seemingly sinister Rolls-Royce with a Gothic “Princess” (María Casares) in all black and pompously snorts like a pig at the elder poet elder, but the pretentious poetaster’s glamour, fame, and fortune has run out because his ghastly gal (who funds Cégeste's unwritten, written works) instigates a brawl that concludes with his death via Satanic SS-like phantoms in black leather on motorcycles. No real princess at all, Cégeste’s macabre muse is really lady death and cons Orpheus into leaving with her in the beauteous Grim Reaper’s Rolls-Royce on the pretense of witnessing the finish of Cégeste (who Orpheus believes is only injured and believes they are going to a hospital) and is transferred through a daunting dimension of negative-color skies and nonsensical noise on the radio. Orpheus is taken to a dilapidated Chateau and is quite enraged and perturbed by lady death, but soon he becomes totally entranced by her audacious aristocratic charms despite being married to a woman named Eurydice (Marie Déa). Likewise, Death’s chauffeur Heurtebise (François Périer) falls hopefully in love with Eurydice, who is eventually killed by the fatal female’s ghastly Gestapo goons. Split by his love for death and the death of his bewitching blonde wife, Orpheus ultimately decides to jump through a mirror (with help from Heurtebise and some special gloves) to save his slain spouse from the Underworld; a poet purgatory where even death is put on trial. A strikingly sacrificial she-Satan, lady death is mature enough to admit, “I don’t have the right to love anyone…yet I love.” If one learns anything from Orpheus, it is that even death is fueled by passion and a poet’s passion is perpetuated by death. In regard to a verbal summary of Orpheus given by a less than arduously analytical radio host made, Cocteau wrote, “But when a serious and attentive man (who I do not know personally) takes the trouble to recall a plot and, in several stages, with an almost childlike elegance, tries to draw a simple and easy-to-read storyline out this very complex plot, without abandoning either his personal viewpoint, or precision, I can only refrain from criticizing him. To do so would be as inappropriate as those critics who hastily condemn a work that is the product of thirty years of research.” Indeed, Orpheus can be interpreted in many ways by many people, but only to Cocteau himself did this poetically phantasmagorical cinematic work have the truest meaning, hence his written words, “Orphée is a realistic film; or, to be more precise, observing Goethe’s distinction between reality and truth, a film in which I express a truth peculiar to myself.” Admittedly, Orpheus was a film that changed my life, or at least the way I look at the artistic medium of film and what it is capable of, when I first saw it a decade ago or so. Since then, if I have come to the realization of what my favorite filmmakers, including auteur directors ranging from F.W. Murnau to R.W. Fassbinder, have in common (aside from being queer krauts) it is that they are all poets, thus underscoring the character of Orpheus’ seemingly contradictory that a poet’s job is, “to write without writing.” That being said, few poets “wrote without writing” (although he was a penetrating master of pen as well) better than Cocteau’s himself with Orpheus being arguably his finest moment as a poet who made better films than the majority of self-described filmmakers.